Since its original release as a seasonal, limited time flavor in May 2016, fans of the ChocMint IsaLean Shake were begging for it to be a permanent flavour. Fans of the Chocolate Mint flavour will be thrilled to know it is now officially a permanent flavor! Boasting the same nutritional benefits as the other shake flavours, this delicious option makes a healthy, tasty treat. If your Cleanse Days could use a little spicing up, Isagenix now offers the perfet solution: Harvest Thins! With a savoury flavour, crunchy texture, and hint of sweetness, your taste buds will thank you. Better yet, they are entirely dairy free and plant based and also boast 11 grams of protein per serving. All this delicious flavour packed into only 100 calories per serving! 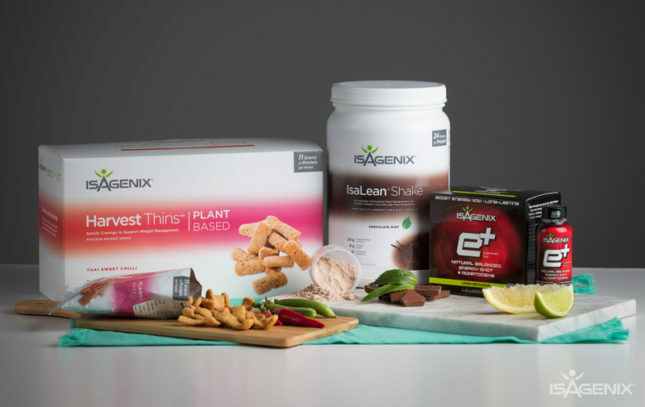 As a standout product, Isagenix knew it wouldn’t be long until customers demanded more flavors of the top-selling, tasty shot of energy. In addition to boosting energy levels, battling fatigue, and fueling athletic performance, e+ now comes in a brand new flavour – Lemon Lime. This mouthwatering flavour utilizes plant-based caffeine soured from yerba mate and green tea along with scientifically supported adaptogen blends to help support healthy energy levels and mental alertness.